And the most improved number of first home buyer loans gold award goes to…..New South Wales! First home buyers has been the topic of many debates over the past couple of years, particularly their ability to crack into the property market. Unexpectedly, New South Wales can now claim the most improved number of first home buyer loans gold award, with the number of first home buyer loans increasing by 70.9% between September quarter 2016 (3,965 loans) to September Quarter 2017 (6,775 loans). The most improved number of first home buyer loans silver award goes to the Australian Capital Territory (64.4%) and the bronze award goes to the Northern Territory (37.9%). Those looking for more affordable options should consider buying a property in the Australian Capital Territory, as their home loan affordability index reading has grown the most at 8.6% over the past 12 months to September quarter 2017. They also have the highest home loan affordability index at 54.2 points in September 2017, well above the Australian average of 33 index points. This is followed by Western Australia (6.4%) and the Northern Territory (5.7%). Interestingly, New South Wales and Queensland home loan affordability index grew at almost an on par level, at 3.0% and 3.6% respectively. 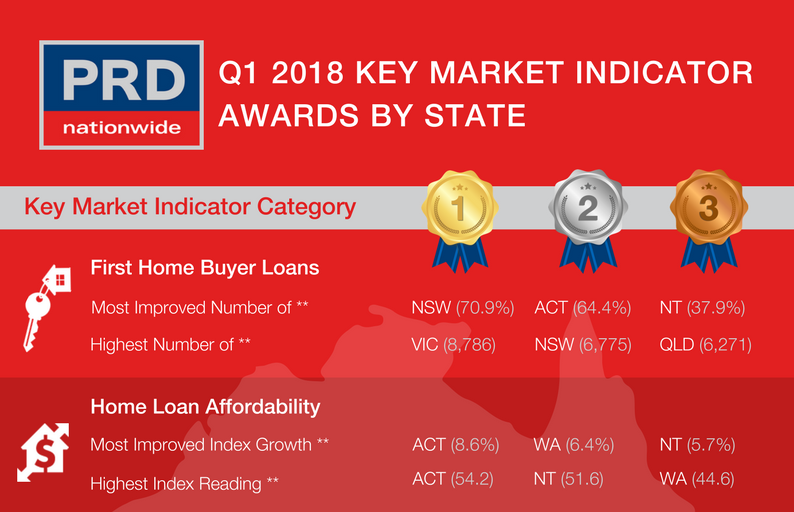 Overall, Australia’s home loan affordability index grew by 1.9% and with all states reporting positive growth there is a positive outlook for affordability.